March 19 (Bloomberg) -- Crude oil dropped for a second day in New York amid concern fuel demand in the U.S., the world’s biggest energy consumer, was slipping and as a firmer dollar damped the investment appeal of commodities. Oil traded below $82 a barrel after the dollar gained against the euro on speculation Greece may fail to secure financial assistance from the European Union. Commercially held U.S. crude inventories rose last week to the highest since August, the Energy Department said March 17. Crude oil for April delivery fell as much as 48 cents, or 0.6 percent, to $81.72 a barrel in electronic trading on the New York Mercantile Exchange. It was at $81.81 at 9:20 a.m. Singapore time. Yesterday, the contract lost 0.9 percent to settle at $82.20, ending a two-day climb. Futures are set for a 0.7 percent gain this week. The dollar was little changed against the 16-nation euro after rising for a second day to $1.3608 yesterday in New York. Greek Prime Minister George Papandreou said he may turn to the International Monetary Fund to overcome Greece’s debt crisis unless EU leaders agree to set up a lending facility at a summit next week. U.S. crude stockpiles increased for a seventh week to 344 million barrels, 5 percent above the five-year average, the Energy Department said. Fuel demand declined by 4.2 percent to 18.8 million barrels a day, the biggest one-week drop since November. Oil also retreated as U.K. Prime Minister Gordon Brown said the U.K. and France are pressing Saudi Arabia to produce more crude. The kingdom is the largest producer in the Organization of Petroleum Exporting Countries. Brown said he discussed the subject with French President Nicholas Sarkozy last week. OPEC, a 12-member group that pumps 40 percent of the world’s oil, maintained supply targets at a March 17 meeting in Vienna. Prices are “beautiful” and there’s no reason to change output quotas, said Saudi Arabia’s oil minister Ali al-Naimi. OPEC is set to increase crude shipments at the end of this month, according to a report yesterday by tanker tracker Oil Movements. The group will ship 23.2 million barrels a day in the four weeks to April 3, up 0.3 percent from the four weeks to March 6, said the Halifax, England-based consultant. Brent crude for May settlement on the London-based ICE Futures Europe exchange fell as much as 44 cents, or 0.5 percent, to $81.04 a barrel. It was at $81.10 at 9:10 a.m. Singapore time. FCPO 3rd month June futures contract traded RM60 lower to close at RM2535 levels as compare to previous trading sessions with a total of 11,885 lots traded in the market. FCPO price plunge lower as soybean oil and crude oil were traded lower during despite were closed firm during overnight trading. FCPO price plunge lower after manage to break down lower from consolidation price range from RM2595 and RM2587 since open for trading sessions. Technically, FCPO price complete its wave 5 count at RM2530 regions; 61.8%, 50% and 223.6% Fibonacci support levels in the hourly price chart. FCPO price would expect to encounter some support levels around RM2530 and RM2476 regions while resistance levels atRM2650 and RM2600 in order for correction to remain intact. FKLI Mar Futures contract traded 10 point lower to close at 1297 levels as compare to previous trading session to with a total of 4,390 lots traded in the market. FKLI was lower after long consolidation above 1300 regions before starts to plunge lower as most of the regional indices were traded lower upon close for trading sessions. FKLI traded lower after break down from symmetric triangle in the hourly price chart where previous support levels seen at 1304 regions. Technically, FKLI underway wave count 5 where resistance levels at 1310 and 1316 must not be violated during trading sessions. However, FKLI wave count 5 would encounter some support around 1290 and 1284; both were 61.8% and 78.6% Fibonacci support levels. 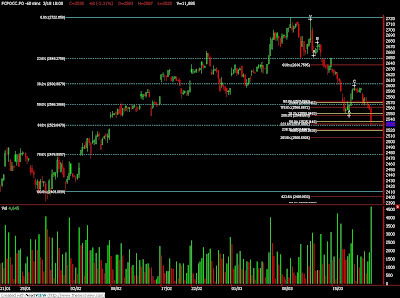 Failure to hold above the support levels shall indicate further correction phase that trigger much selling activities. March 17 (Bloomberg) -- OPEC, content with oil prices exceeding $80 a barrel, decided for the fifth time since 2008 to keep its production limits unchanged amid signs that a worldwide glut of crude is disappearing along with the recession. Ministers from OPEC’s 12 member countries agreed as expected to stand by the output quota at their meeting today in Vienna, according to Libyan delegate Shokri Ghanem. The Organization of Petroleum Exporting Countries reaffirmed the quotas at every meeting since they were set in December 2008, even though the group is exceeding the limits by the equivalent of a supertanker of crude a day. OPEC, supplying about 40 percent of the world’s oil, set its official cap at 24.845 million barrels a day. OPEC members excluding Iraq pumped 26.8 million barrels a day last month, 1.9 million more than the target, data compiled by Bloomberg show. Shipments will rise again this month, according to tanker-tracker Oil Movements. Oil prices surged 78 percent last year as OPEC curtailed as much as 3.7 million barrels a day of output and the global economy started to emerge from its worst slump since World War II. Crude futures traded as high as $82.76 a barrel today on the New York Mercantile Exchange, up 4 percent this year. Current prices are “beautiful,” Saudi Arabian Oil Minister Ali al-Naimi told reporters before the start of today’s meeting. At OPEC’s last meeting in December 2009, he said prices between $70 and $80 a barrel are “perfect.” Angolan Oil Minister Jose Maria Botelho de Vasconcelos said yesterday that prices between $80 and $90 a barrel are good and $90 would be too high. One minister, Algeria’s Chakib Khelil, said the group may have to raise production quotas later this year because of rising prices. There is a “50-50 chance” that output limits will be raised later in 2010, he told reporters yesterday. Banks including Goldman Sachs, Bank of America Merrill Lynch and Societe Generale forecast that demand for oil will recover this year, requiring new crude supply. Goldman Sachs sees crude reaching $96.50 a barrel within 12 months, while Societe Generale forecasts an average of $104 in 2012 and Merrill says prices may rise as high as $150 in 2014. Signs of recovering demand in developed economies, particularly the U.S., and falling oil inventories mean OPEC will need to increase quotas later this year to balance supply, said Tobias Merath, head of commodity research at Credit Suisse Group AG in Zurich. The group will meet again on Oct. 14, according to OPEC Secretary-General Abdalla El-Badri. OPEC plans to add 12 million barrels to its daily production capacity by 2015, equal to what Saudi Arabia can pump today. The gains would exceed the expected growth in demand, according to the International Energy Agency. For now, OPEC said its own analysis shows it is pumping more oil than is needed. OPEC estimated in a March 10 report that its current production is 1.5 million barrels a day more than the demand for its crude in the second quarter, after analyzing non-member production and global consumption. In February, members complied with 53 percent of the record 4.2 million barrels a day cuts announced in 2008, OPEC data shows. Nigeria and Angola are exceeding their quotas and have a standing request with OPEC to enlarge their entitlement. The organization typically avoids tackling such issues until it makes broader changes. The national quotas are not published on the group’s Web site. Production from the 11 OPEC members bound by quotas rose to 26.811 million barrels a day in February, the organization said in a March 10 report. Shipments will increase 0.9 percent by the end of the month, according to Oil Movements based in Halifax, England. OPEC’s 12 members are Algeria, Angola, Ecuador, Iran, Iraq, Kuwait, Libya, Nigeria, Qatar, Saudi Arabia, the United Arab Emirates and Venezuela. Iraq is exempt from production quotas. FCPO 3rd month June futures contract traded RM26 higher to close at RM2595 levels as compare to previous trading sessions with a total of 8,890 lots traded in the market. FCPO price consolidate around high side during trading sessions as crude oil and soybean oil were trade firm during overnight and electronic trading. FCPO price opened higher but consolidate around RM2600 and RM2590 regions during trading sessions. Technically, FCPO price view as form complex formation above 38.1% Fibonacci support levels at RM2587 regions before completion of wave C. However, FCPO price would anticipate to further correction towards south provided resistance levels at RM2606 and RM2624 were not violated in the coming trading sessions. 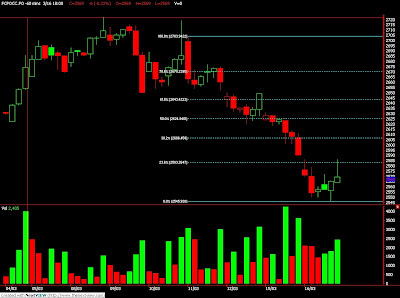 Support levels were seen at RM2568 and RM2545 regions. FKLI Mar Futures contract traded 1.5 point higher to close at 1307 levels as compare to previous trading session to with a total of 5,169 lots traded in the market. FKLI was traded marginally higher despite regional indices and Dow Jones electronic trading were traded strong during trading hours. 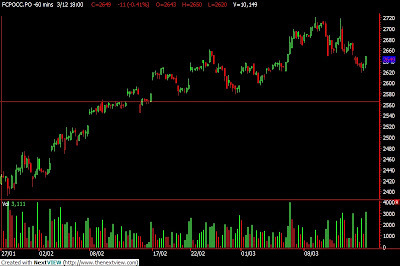 FKLI reached objective price at 1312 regions; 100% and 38.1% Fibonacci resistance levels, consolidate for 5 hours before started to plunge lower in the 2nd trading sessions before FKLI close for trading. Technically, FKLI seems temporary topped around resistance levels at 1312 and 1318 region; both were 38.1% and 61.8% Fibonacci resistance levels. FKLI were anticipating further correction phase provided support levels at 1298 and 1286 fails to hold against the selling pressure. March 17 (Bloomberg) -- The Organization of Petroleum Exporting Countries, content with prices over $80 a barrel, has no need to change output at a meeting in Vienna later today, even with oil supplies exceeding consumption, ministers said. Eleven of OPEC’s 12 members have said the group is likely to keep production unchanged. Oil prices are in the right range and there’s no need to alter output, Saudi Arabian Oil Minister Ali al-Naimi said while his Algerian counterpart, Chakib Khelil, said there is a “50-50 chance” that quotas will be raised at a subsequent meeting in September. Oil rose above $82 a barrel on the New York Mercantile Exchange yesterday, after rallying 78 percent in 2009 to $79.36. OPEC embarked on the biggest production cut in its 50-year history at the end of 2008 and has maintained those quotas at every subsequent policy-setting meeting. OPEC members are set to continue exceeding production quotas even though the group’s own analysis shows it is pumping more oil than is needed by the market. Supply reductions would risk sending prices soaring, endangering the global economic recovery, ministers and analysts said. OPEC’s current production is 1.5 million barrels a day more than the demand for its crude in the second quarter, the group said in a monthly report on March 10, after analyzing non-member production and global consumption. OPEC, which supplies about 40 percent of the world’s oil, is meeting as production exceeds its quotas by the equivalent of a supertanker of crude a day. Still, 42 of 44 analysts surveyed last week by Bloomberg predict the organization will maintain its official quota at 24.845 million barrels a day at today’s meeting. “The sentiment is to maintain decisions taken in December 2008,” Angolan Oil Minister Jose Maria Botelho de Vasconcelos said yesterday at Luanda airport. On arriving in Vienna yesterday, Vasconcelos said oil prices between $80 and $90 a barrel are good and that prices over $90 are too high. The range suggested by Angola is $10 higher than the $70- $80 level that Saudi Arabia’s Al-Naimi described on Dec. 22 as being the “perfect price, an excellent price for the world.” He spoke in Luanda, where OPEC held its last meeting, and later that day OPEC agreed to keep production quotas unchanged. OPEC’s full ministerial meeting tomorrow will be the first to be held at its new headquarters in Vienna. Oil rallied last year as OPEC curtailed as much as 3.7 million barrels a day of output and the global economy emerged from its worst slump since World War II. Buoyed by high prices, the group’s members are paying less attention to quotas and achieving only about 53 percent of their promised 4.2 million-barrel-a-day output cutback, according to the March 10 report from the OPEC secretariat. Iran, Angola and Nigeria are all pumping more than promised, and Saudi Arabia sits on 4 million barrels a day of idle capacity that can be started when demand climbs. Among OPEC’s 12 members, only Iraq is exempt from limits and Oil Minister Hussain al-Shahristani said yesterday that his country won’t discuss its inclusion in the quota system until Iraqi production exceeds 4 million barrels a day, in about two years time. Nigeria and Angola are among OPEC members that are exceeding their quotas the most and have a standing request with OPEC to enlarge their entitlement. The organization typically avoids tackling such issues until it makes broader changes. The national quotas are not published on the group’s Web site. March 17 (Bloomberg) -- Crude oil traded above $82 in New York after rising as the dollar fell against the euro, buoying demand for commodities as an alternative investment, and as OPEC ministers indicated they would refrain from increasing output. Oil rose the most in four weeks yesterday after Standard & Poor’s Ratings Services affirmed its sovereign-credit ratings on Greece, strengthening the euro. Saudi Arabian Oil Minister Ali al-Naimi said this week oil prices are in the right range. The kingdom is OPEC’s biggest producer. Crude oil for April delivery gained 47 cents, or 0.6 percent, to $82.17 a barrel, in electronic trading on the New York Mercantile Exchange at 10:30 a.m. Sydney time. Yesterday, the contract rose $1.90, or 2.4 percent, to $81.70 a barrel. The dollar traded unchanged at $1.3766 per euro at 10:31 a.m. Sydney time, after falling 0.7 percent yesterday. Some investors buy commodities such as oil and gold as an alternative investment to the dollar. The U.S. currency remained lower after the Federal Reserve retained its pledge to keep the main interest rate near zero for an “extended period” to stimulate the economy. The U.S. is the world’s largest energy consumer. The Energy Department said last week that oil prices will average 30 percent higher in 2010 from 2009 as demand rebounds with the global economic recovery. Crude oil inventories rose by 403,000 barrels last week to 344 million, the American Petroleum Institute said in a report yesterday. Supplies of distillate fuel, a category that includes heating oil and diesel, fell by 756,000 barrels, the API said. A U.S. government report today may show crude inventories rose 1.1 million barrels in the week ended March 12 from 343 million the week before as refineries bolstered stockpiles before the summer driving season. The outlook is based on the median of 17 estimates in a Bloomberg survey. It would be the seventh consecutive increase. The Energy Department is scheduled to release its inventory report at 10:30 a.m. in Washington. The Organization of Petroleum Exporting Countries, which pumps about 40 percent of the world’s oil, is scheduled to meet today for the first time this year. OPEC cut output quotas by a record 4.2 million barrels a day at the end of 2008 as demand plunged. Compliance fell to 53 percent in February, OPEC said last week in its monthly report. The group will maintain existing targets as prices hold above $80 a barrel, according to 42 of 44 analysts surveyed last week by Bloomberg News. March 17 (Bloomberg) -- The yen and dollar weakened on speculation the U.S. and Japan will maintain economic policy stimulus and after stocks and commodity prices rose, boosting demand for riskier assets. The Canadian dollar touched it strongest in almost two years versus the greenback as prices for oil, one of the nation’s biggest exports, climbed for a second day. The yen fell against 14 of the 16 most-traded currencies on prospects Bank of Japan Governor Masaaki Shirakawa will ease credit just as his counterparts across Asia move to withdraw liquidity following the global recession. The yen weakened to 124.54 per euro as of 9:54 a.m. in Tokyo after falling 0.4 percent yesterday to 124.31 in New York. The euro bought $1.3764, little changed from yesterday when it advanced 0.7 percent. The Japanese currency slipped to 90.42 per U.S. dollar from 90.31 yesterday, when it reached 89.99, the strongest since March 10. The Bank of Japan is scheduled to announce its policy decision after a two-day meeting by early afternoon in Tokyo. Shirakawa will speak at a press conference at 3:30 p.m. local time. FCPO 3rd month May futures contract traded RM6 lower to close at RM2569 levels as compare to previous trading sessions with a total of 11,390 lots traded in the market. FCPO price consolidate around the support at rebounded during end on trading sessions as crude oil and soybean oil electronic trading were traded higher before trading sessions end. FCPO price opened lower and consolidate around 450% Fibonacci support levels at RM2550 regions before starts to rebound higher during trading sessions. Technically, FCPO price seems completed short term wave count 3 at RM2545 regions and expecting rebound provided support levels at RM2545 and RM2500 were not violated during trading sessions. However, we anticipate strong resistance levels seen at RM2625 and RM2670 as our strong resistance levels while RM2704 seen as trend reversal stages on FPCO current trading. FKLI Mar Futures contract traded 2.5 point higher to close at 1305.5 levels as compare to previous trading session to with a total of 6,331 lots traded in the market. FKLI was traded sideways during trading sessions as regional indices and Dow Jones electronic trading were also traded within tight range. FKLI consolidate within range from 1308 to 1302 range during trading sessions after attempt to penetrate resistance levels at 1312 failed in the earlier sessions. Technically, support level at 1302 seems holding well against selling pressure after 3rd attempt to penetrate support levels. Upon wave count, FKLI would anticipate on rebound provided support levels at 1298 and 1286 were not violated during trading sessions while resistance levels were seen at 1318 and 1329 regions. However, FKLI on overall still riding on correction phase in the coming trading sessions. March 15 (Bloomberg) -- OPEC doesn’t need to change its oil production quotas this week, and there’s no requirement for the group to pump at a higher rate than it already is, Libya’s top oil official said. “There’s no need for any change,” Shokri Ghanem, chairman of Libya’s state-run National Oil Co., told reporters at his hotel in Vienna today. “The market is oversupplied. We’re going to call for compliance” with official quotas. The Organization of Petroleum Exporting Countries meets March 17 at its new headquarters in the Austrian capital to determine production quotas for the next few months. OPEC, supplying about 40 percent of the world’s oil, is meeting as production exceeds its quotas by the equivalent of a supertanker of crude a day. Forty-two of 44 analysts surveyed last week by Bloomberg predict the organization will maintain its official quota at 24.845 million barrels a day at this week’s meeting. Earlier today, in comments published on the state company’s Web site, Ghanem said demand for OPEC’s own crude may not rise this year, and may actually fall, because the growth in global demand will be absorbed by greater production from non-members. “For example, the U.S. and Russia are expected to increase their production,” Ghanem said in the statement. OPEC’s 12 members are Algeria, Angola, Ecuador, Iran, Iraq, Kuwait, Libya, Nigeria, Qatar, Saudi Arabia, the United Arab Emirates and Venezuela. Iraq is exempt from the quota system. March 15 (Bloomberg) -- Soybeans rose after an industry report showed increased demand from U.S. makers of animal feed and vegetable oil. Corn fell for an eighth session, the longest slump since 2005, on slowing demand for U.S. grain. Processors including Bunge Ltd. used 148.4 million bushels of soybeans during February, up 15 percent from a year earlier and the most ever for the month, the National Oilseed Processors Association said today in a report. Domestic consumption and exports from September through February were a record 2.089 billion bushels, according to Prudential Bache Commodities LLC. Soybean futures for May delivery gained 4.5 cents, or 0.5 percent, to $9.30 a bushel on the Chicago Board of Trade, after earlier touching $9.2175, the lowest level since Feb. 9. Most- active futures fell 1.8 percent last week, the second straight weekly decline. Corn futures for May delivery fell 1 cent, or 0.3 percent, to $3.6325 a bushel in Chicago. The most-active contract on March 11 touched $3.615, the lowest price since Feb. 9. The last time the commodity declined for eight straight sessions was in September 2005. Corn prices slipped today as the stronger dollar reduced the allure of commodities and the cost of imports from Argentina and Brazil, the two biggest exporters after the U.S. The U.S. Dollar Index, a six-currency gauge of the greenback’s strength, advanced as much as 0.7 on speculation that sovereign credit ratings may deteriorate. Combined corn output in Argentina and Brazil will rise 9.1 percent this year, the U.S. Department of Agriculture said last week. Inspections of U.S. corn for export fell 3.5 percent to 36.5 million bushels in the week ended March 11, the smallest total in four weeks, the USDA said. Corn is the biggest U.S. crop, valued at $48.6 billion in 2009, followed by soybeans at $31.8 billion, government figures show. March 15 (Bloomberg) -- Gold rose in New York, rebounding from the biggest weekly loss in more than a month, on speculation that sovereign-debt concerns will boost demand for the metal as an alternative to holding currency. The euro fell as much as 0.9 percent against the dollar after the finance ministers of Germany and France ruled out a decision today on helping Greece manage its fiscal difficulties. Moody’s Investors Service said the U.S. and the U.K. have moved closer to losing their Aaa credit ratings. Gold futures for April delivery rose $3.70, or 0.3 percent, to $1,105.40 an ounce on the Comex in New York. The metal fell 3 percent last week, the most since Jan. 22. Greece is seeking to narrow a budget deficit that is the widest gap among the 16 nations that share the euro. Gold priced in euros reached a record on March 5. Under a so-called baseline scenario, the U.S. will spend more on debt service as a percentage of revenue this year than any top-rated country except the U.K., Moody’s said today in a report. The U.S. will be the biggest spender through 2013. “Jitters lent fresh support to the precious metals,” said Jon Nadler, a Kitco Inc. analyst in Montreal. Gold’s gains may be limited on concern that China will raise its benchmark one-year lending rate, curbing demand for raw materials. The Reuters/Jefferies CRB Index of 19 commodities fell as much as 1.3 percent after a 1.3 percent loss last week. “Most countries are reluctant to raise interest rates at this point,” said Lesh of FuturePath. “They don’t know if their economies can handle it. But China has been tightening and they can move quickly.” The Asian nation’s central bank increased reserve requirements for lenders last month. In other markets, silver futures for May delivery advanced 6 cents, or 0.4 percent, to $17.108 an ounce on the Comex. Platinum for April delivery rose $7.40, or 0.5 percent, to $1,615.80 an ounce on the New York Mercantile Exchange. June palladium futures slid $2.50, or 0.5 percent, to $460.65 an ounce on the Nymex. March 16 (Bloomberg) -- The yen rose against the euro on receding optimism that European Union finance ministers will provide financial assistance to Greece, boosting demand for the Japanese currency as a refuge. Japan’s currency advanced to 123.26 per euro as of 9:35 a.m. in Tokyo from 123.83 in New York yesterday. It climbed to 90.24 per dollar from 90.53. The euro declined to $1.3661 from $1.3677, and bought 90.81 pence from 90.83 pence. The yen gained for a second day against Europe’s common currency before all 27 EU finance ministers meet later today. On the agenda in addition to Greece are proposals to clamp down on hedge funds and credit default swaps. The European currency has fallen 4.5 percent against the dollar this year amid concern Greece’s rising debt-servicing costs will keep it from narrowing a budget deficit that is more than four times the European Union’s 3 percent limit. 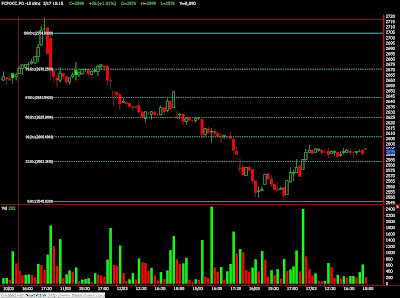 FPO 3rd month May futures contract traded RM59 lower to close at RM2590 levels as compare to previous trading sessions with a total of 12,602 lots traded in the market. FCPO price traded lower since open for trading sessions as soybean oil and crude oil were traded lower during overnight and electronic trading despite favorable export figure were release during trading sessions. 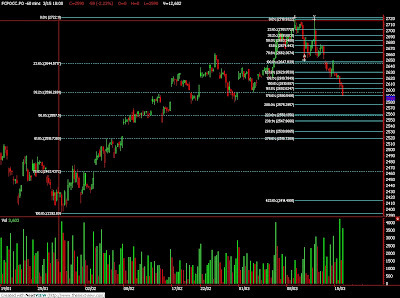 FCPO price opened lower and continue to test next nearest support levels at RM2610 region; 78.6% Fibonacci support levels but only manage to hold nearly 2 hours before selling pressure overcome support activity and tested next support levels at RM2590 regions; 178.6% Fibonacci support levels. Technically, FCPO wave C count to meet objective support levels at RM2557 and RM2518; both were 50% and 61.8% Fibonacci support levels. Failure hold FCPO price to trade above the support levels shall further indicates larger correction phase to take in place. FCPO price would expect to trade lower provided resistance levels at RM2650 and RM2677 were not violated during trading sessions. FKLI Mar Futures contract traded 13 point lower to close at 1303 levels as compare to previous trading session to with a total of 5,085 lots traded in the market. FKLI traded lower since open for trading in the morning sessions as Dow Jones electronic trading traded lower while later follow by regional indices that traded lower during trading sessions. 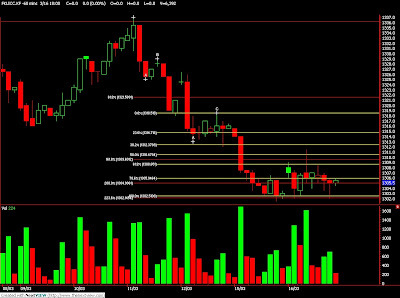 FKLI trigger 1st sell signal after make new low at 1311 as compare with last week trading sessions and continue to trade further lower until found support levels at 1302 regions; 223.6% and 100% Fibonacci support levels. Technically, FKLI further confirmed undergoing short term correction phase after support level at 1312 fails to hold against the selling pressure during trading sessions. FKLI would anticipate further correction provided resistance levels at 1318 and 1329 were not violated in the coming trading sessions. However, FKLI would expect to have rebound activity provided support levels at 1298 and 1286.5 were not violated in the coming trading sessions. March 15 (Bloomberg) -- Palm oil dropped for a third day to the lowest level in almost two weeks as crude oil fell and on concerns record soybean supplies from South America will reduce the need for substitutes. May-delivery futures lost as much as 1.8 percent to 2,601 ringgit ($784) a metric ton on the Malaysia Derivatives Exchange, the lowest level since March 2, and traded at 2,606 ringgit at 4:37 p.m. Crude for April delivery was down 0.5 percent at $80.87 a barrel in New York. “A slight pullback could be under way this week” for crude oil, and with palm oil failing to advance beyond 2,726 ringgit last week, “follow-through selling can be expected,” a technical report by RHB Research Institute Sdn. said today. Soybeans for May delivery dropped as much as 0.4 percent to $9.2175 a bushel in Chicago and traded at $9.2550 at 5 p.m. Singapore time. Prices may drop below $9 a bushel as China, the world’s biggest importer, switches more cargoes from the U.S. to South America, according to a Bloomberg survey on March 12. Brazil’s soybean processors raised their crop forecast for the current marketing year to 67.6 million metric tons. The outlook for output in the year that started Feb. 1 was raised from 65.2 million tons estimated on Jan. 26, Abiove, as the association is known, said March 12. Exports from Malaysia, the second-largest producer, climbed 18 percent in the first 15 days of March to 669,227 tons, independent market surveyor Intertek said. Shipments to China surged by 29 percent to 191,059 tons, and to India and the subcontinent by 25 percent to 165,456 tons, Intertek said. Overall exports gained 5.1 percent to 638,548 tons in the period, according to Societe Generale de Surveillance. India imported 2.39 million tons in the four months ended February, up from 2.33 million tons a year earlier, according to data from the Solvent Extractors’ Association of India today. Inbound shipments of vegetable oils may reach a record 9.1 million tons in the year ending Oct. 31, up from 8.66 million tons a year ago, a processor’s group said on March 12. The purchases will include 7 million tons of palm oil-products, said BV Mehta, co-chairman of the crop committee of the Central Organization for Oil Industry & Trade. In China, the largest edible oils user, September-delivery palm oil dropped 1 percent to 6,848 yuan a ton on the Dalian Commodity Exchange while soybeans lost 0.4 percent to 3,800 yuan. March 12 (Bloomberg) -- Crude oil may fall next week on rising U.S. inventories and speculation that demand will decrease next month, a Bloomberg News survey showed. Twenty-three of 50 analysts, or 46 percent, said oil will decline through March 19. Fourteen respondents, or 28 percent, predicted that futures will increase and 13 said there will be little change in prices. Last week analysts were split, with 38 percent of those surveyed forecasting a gain and an equal number looking for a drop. U.S. inventories of crude oil rose 1.43 million barrels to 343 million last week, an Energy Department report on March 10 showed. It was the sixth straight increase and left stockpiles at the highest level since August. “I’m bearish because demand is lagging and supply rising,” said Tim Evans, an energy analyst at Citigroup Global Markets Inc. in New York. Refineries operated at 80.7 percent of capacity last week, down 1.1 percentage points from the previous week. Refiners often schedule maintenance for March as winter heating-fuel consumption wanes and before the pick-up in gasoline demand that occurs in the summer. The Organization of Petroleum Exporting Countries is scheduled to meet in Vienna on March 17. Shokri Ghanem, chairman of Libya’s National Oil Corp., said “no new decision is expected” at the meeting on production, according to a March 9 statement. “It doesn’t look like OPEC will do anything to change the landscape at next week’s meeting,” Evans said. Crude oil for April delivery fell 26 cents this week, or 0.3 percent, to $81.24 a barrel on the New York Mercantile Exchange. Futures are up 73 percent from the level of a year ago. The oil survey has correctly predicted the direction of futures 48 percent of the time since its start in April 2004. March 12 (Bloomberg) -- Soybeans may drop below $9 a bushel for the time since October as China, the world’s biggest importer, may switch more cargoes from the U.S. to South America, according to a Bloomberg survey. Prices may decline 4 percent or more from the current price of $9.36 a bushel in the next month as more cancelations may be reported, according to nine out of 10 traders and researchers contacted in China for the survey. A net purchase of 192,400 tons of U.S. soybeans from China was canceled in the week through March 4, the Department of Agriculture said yesterday. China, buyer of about half the world’s soybean exports, may seek more supplies from South America as Brazil and Argentina gather record harvests and before the new U.S. crop arrives in the fall. Soybean futures tumbled 2.9 percent yesterday, the most in almost two months, on speculation that importers will curb purchases of U.S. supplies. “Prices will certainly drop, maybe to $8.70 to $8.90 a bushel,” said Li Qiang, managing director at Shanghai JC Intelligence Co., in Shanghai. More cancelations “are likely to come out. I don’t think we have seen the end,” he said. Imports by China surged 23 percent to 11.8 million metric tons from December through February from 9.6 million tons in the year ago period, according to customs. Soybean oil dropped 5.3 percent this year on the Dalian Commodity Exchange and meal fell 8.6 percent. Live hog prices also have declined on lower demand, according to the National Development and Reform Commission. The bulk of the country’s purchases from South America may arrive in April and May, so the oversupply may get worse before it gets better, Huang said. China may still increase soybean purchases to a record this year as rising incomes and the world’s fastest growing major economy spur consumption of cooking oil and meat. Imports may climb to 44 million tons in 2009-2010, Wang Yinji, a deputy general manager at Cofco Oils & Grains Co., told a conference in Qingdao March 10. The nation bought 41 million tons in 2008-2009, U.S. Department of Agriculture data show. The country aims to be 40 percent self-sufficient in oilseeds in the “medium to long-term”, so 60 percent of supplies will need to be imported, according to Bao Kexin, president of China Grain Reserves Corp.
March 12 (Bloomberg) -- Gold in New York fell to the biggest weekly loss in seven weeks on speculation that China will raise interest rates to control inflation, reducing demand for raw materials including precious metals. Consumer prices in China rose 2.7 percent in February, the most in 16 months, the government said yesterday. The Reuters/Jefferies CRB Index of 19 commodities slumped today, led by energy contracts, and has dropped every day this week. Accelerating growth in China last year and low interest rates helped send gold to a record $1,227.50 an ounce on Dec. 3. Gold futures for April delivery fell $6.50, or 0.6 percent, to $1,101.70 an ounce on the Comex in New York, leaving the most-active contract down 3 percent this week, the biggest weekly drop since Jan. 22. Gold may extend declines should the U.S. economic recovery spur the Federal Reserve to raise interest rates before the European Central Bank, boosting the value of the dollar. Sales by U.S. retailers climbed unexpectedly in February from January, the Commerce Department said today. Last year, gold rallied 24 percent as the Fed kept its benchmark interest rate near zero to revive the economy. The ECB’s main rate is at 1 percent. Before today, the euro dropped 4.5 percent this year against the dollar after gaining 2.5 percent in 2009. This year’s slump is partly because investors are concerned that the effect of Greece’s budget difficulties on its debt may spread to other European Union countries. Investors generally purchase the metal, priced in dollars, to hedge against declines in the U.S. currency. In other markets, silver futures for May delivery fell 11.2 cents, or 0.7 percent, to $17.048 an ounce on the Comex, leaving the most-active contract down 1.9 percent for the week. Platinum for April delivery fell $4.30, or 0.3 percent, to $1,608.40 an ounce on the New York Mercantile Exchange. The metal climbed 1.9 percent this week, the second straight gain. Palladium for June delivery rose $2.15, or 0.5 percent, to $463.15 an ounce on the Nymex. The metal slid 2.8 percent this week, the second decline in three weeks. FCPO May Futures contract traded RM11 lower as compare to previous trading sessions to close at RM2649 with a total of 10,149 lots traded in the market. FCPO manage to recover before end of trading sessions after open lower in the morning sessions as crude oil and soybean oil overnight trading were traded weak. 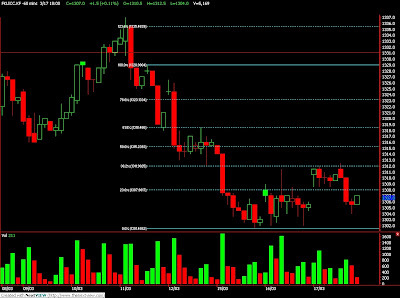 FCPO price was traded lower to meet support levels at RM2620 region before manage to close at RM2649 region at 50% Fibonacci resistance levels. Technically, FCPO price would expect to traded further lower in the coming trading sessions provided resistance levels at RM2679 and RM2719 and RM2702 were not violated in the coming trading sessions. However, FCPO price next nearest support levels at RM2610 and RM2575 regions. FKLI March Futures contract was traded 5 points lower as compare to previous trading session to close at 1316 levels with a total of 5,201 lots traded in the market. FKLI was traded lower during trading sessions as regional indices were traded lower during trading sessions despite were open higher during morning sessions but FKLI soon consolidate in 2nd trading sessions. 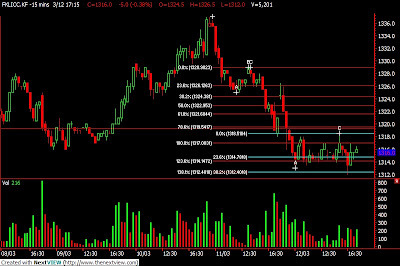 FKLI traded lower after manage to rebound 78.6% Fibonacci resistance levels at 1326.5 regions before to consolidate within range from 1314 to 1318 regions. 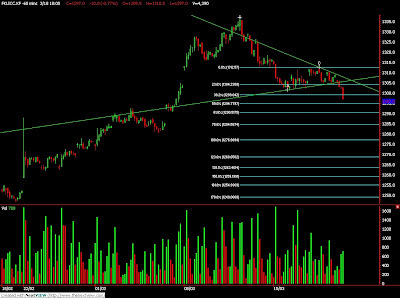 However, FKLI attempted to reach 1312 regions shows a possibility of wave 5 completion in the 15min price chart. Technically, FKLI would seems traded lower provided resistance levels at 1318.5 and 1329 were not violated in the coming trading sessions as it would violated Elliott Wave rules. 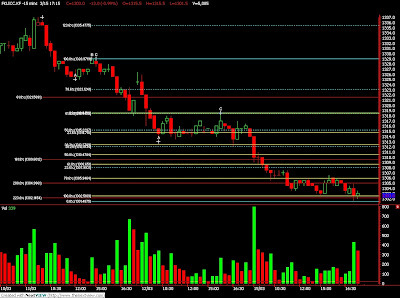 However, FKLI next nearest support levels were seen at 1302 and 1288 regions.